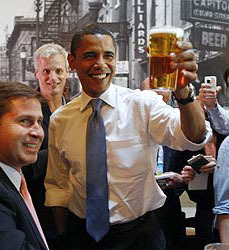 You know, back when Obama first told the press that he’d invited Skip Gates and James Crowley to the White House for a beer, I thought it was about as brilliant a piece of political ju jitsu as I’d ever seen. A beer! In the White House! But now that Der Tag is here — well, I’m beset with a grim sense of foreboding. It just doesn’t seem like quite such a great idea in the cold light of day, and it’s almost certain to keep this ridiculous incident in the news for another week or so. Plus there are so many ways it could go pear shaped I can hardly count them. So we’ll see. Can Obama turn political dross into gold once again? I wouldn’t bet against him, but I sure wish he were spending the day instead with some poor woman who got screwed by her insurance company or something. No discrimination for preexisting conditions. No exorbitant out-of-pocket expenses, deductibles or co-pays. No dropping of coverage for the seriously ill.
No annual or lifetime caps on coverage. Extended coverage for young adults. I can’t predict the future any better than anyone else, but I think this is the right way to sell healthcare reform. It won’t satisfy the wonks, who will continue to debate public options vs. exchanges vs. co-ops, but it’s the kind of thing the general public wants to hear. There should have been a ninth item about being able to see the doctor of your choice, and maybe a tenth about guaranteeing all health decision are between you and your doctor, but it’s still better than nothing. And a lot better than most of the stuff we’ve seen before.